Size: Single Drawer (36 Pods) All your K-Cups, organized and accessible With the Kuuk Keurig cup holder, you have all your different roasts availableat the simple slide of a drawer. One drawer holds 36 cups, and you'll alwaysknow when you're running low on coffee and it's time to restock. 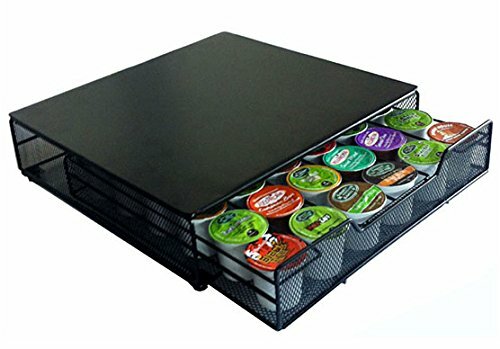 Stylish, space-saving design This Keurig cup storage drawer is designed with the modern kitchen in mind,and built to allow a coffee brewer to sit on its top. Place your Keurig breweron top of the storage drawer for quick coffee making in the morning! Easy to clean Being in the kitchen, your K-Cup holder may get dirty - not to worry, you cansimply wipe the tray clean with a damp cloth. For more a more thoroughcleaning job, you can also remove the tray from the exterior casing. Single and dual level trays available A single tray stores 36 cups, but for real coffee lovers there's the double-tray option which stores up to 72 K-Cups! With the dual-level Keurig cupstorage drawer in your kitchen - as far as coffee goes at least - you'll neverbe left wanting again.